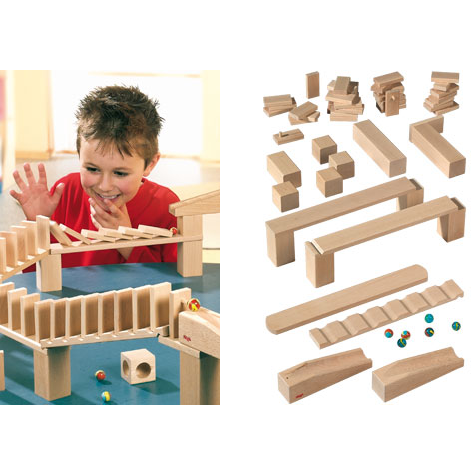 The Haba Domino Rally Set is a large marble and domino run whichy can be used on it's own or added to other marble runs. The set has a total of 59 pieces which include 40 wooden dominos. 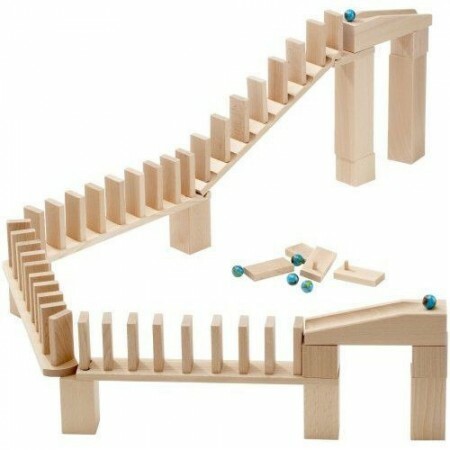 marble and domino tracks, a domino staircase, 6 marbles and 2 dominos which work at either end to knock and be knocked by the marbles. There's loads of fun for all the family setting it up over and over, you can add other dominos or marble runs to make huge runs around the house. Recommended for ages 3-10, but we think adults will secretly enjoy play with it too.